Romeo Castellucci’s work is direct, economic with words and creates striking images. In this play, we are taken to the beginnings of the building of a nation. A recollection of a forgotten celebration, reawakening the primary purpose of theatre: a dual role with a vital political combat. 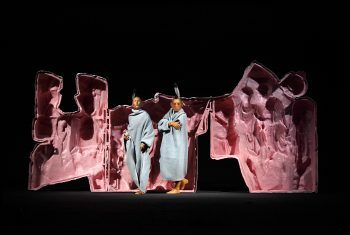 Romeo Castellucci’s theatre is paradoxical: he draws upon his deep reflections, essential texts, complex ideas, but his work is direct, economic with words and full of striking images. His stunningly beautiful productions mix a traditional approach to theatre with the very latest technology, leaving the audience with an unforgettable experience. Alexis Tocqueville wrote his famous essay on the American political system after his voyage to the United States in 1831. He describes the birth of this new democracy inspired by the Puritans, that frees itself for the first time from a system invented by Athens and outmoded in the old Europe. This new democracy is committed to individualism in which Tocqueville predicts tyrannical interpretations. In Ancient Greece tragedy goes with democracy, they go hand in hand. America destroys this tie and leaves individuals exposed to a burning sun. Romeo Castellucci takes us to a time when nothing has been won, he recalls a forgotten celebration, reawakening theatre’s primary purpose: a dual role with a vital political combat. Thursday 8 February, add only 5 € and see The Institute of Global Loneliness at 7pm. A meeting is proposed to the audience of Democracy In America. It will present itself as a moment of exchange and sharing of questions, reflections and common emotions around the aesthetic, dramatic and cultural stakes that animate the representation and more generally the work of Romeo Castellucci. With Olivia Corsini, Giulia Perelli, Gloria Dorliguzzo, Evelin Facchini, Stefania Tansini, Sophia Danae Vorvila and twelve dancers.